Along with the Sangre de Cristo range, 35 miles distant across the Rio Grande valley, the Jemez Mountains form the southernmost tip of the Rocky Mountains, which stretch over 2,000 miles north into Canada. They hold no great natural landmarks, just a large area of mostly undisturbed forested wilderness, containing rocky peaks, meadows, streams, lakes and waterfalls, plus only occasional houses and villages. 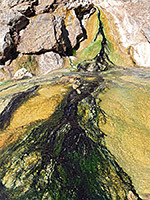 More unusual features result from past volcanic activity, including hot springs, sulphurous vents and a large caldera - a ring of hills comprising the remains of several long-extinct volcanoes. All the mountainous area forms part of the 1.6 million acre Santa Fe National Forest, so is a good place for free primitive camping and many other recreational activities. 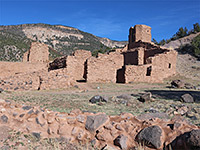 Also within the mountains are several historic places, the largest Jemez Historic Site, which protects the ruins of a Spanish mission and a Native American pueblo. 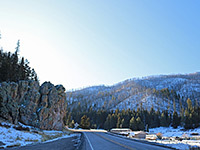 The one main route through the hills is Hwy 4 - from Los Alamos and Bandelier National Monument in the east, this winding, scenic and not too busy road follows the Jemez River for part of its 74 mile route, eventually descending into the flatter, more desert-like land of the Jemez Indian Reservation. 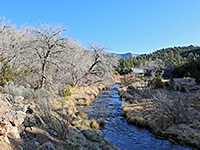 The most interesting section is around Jemez Springs as here are found most of the hot springs and pools, some hidden deep in the forest but others quite close to the main road. A few are large (and safe) enough for bathing. Highway 4 forms most of the Jemez Mountain Trail, an 80 mile National Scenic Byway, completed by a 25 mile section of US 550 between Bernalillo (starting at the Coronado Monument) and San Ysidro; the far end of the byway is at Bandelier National Monument to the northeast. From the southern end of Hwy 4, in San Ysidro, the road heads north into the mountains, following the Jemez River, initially through high desert land of low mesas and exposed red sandstone formations, then into a wooded valley. Along the way are many riverside access points, for fishing or swimming. The road passes through Jemez Pueblo, the main settlement in the small Jemez Indian Reservation, then proceeds past a major fork in the valley to the community of Jemez Springs, location of Jemez Historic Site (formally a State Monument); the evocative and substantial ruins of a 17th century Spanish mission, built amidst the more fragmentary remains of a 15th century pueblo (Giusewa). On the far side of town, the Jemez River flows past a hot spring, right beside the road, a source which has over the millennia deposited large amounts of travertine, creating an elongated ridge, partly damming the river which now flows through cavity in the dam, over a 15 foot waterfall (Soda Falls) and into a deep pool. Several gaseous vents and tiny bubbling hot water fountains are found near the roadside opposite. 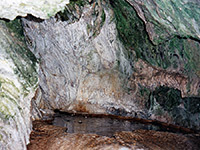 Just above the vents, also in the travertine, is a short cavern, known as Jemez Cave or Crystal Cave, though access to this has been closed since 2012 following visitor damage. 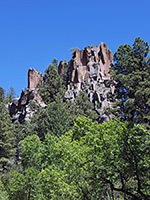 The next point of interest along the highway is Battleship Rock, an isolated volcanic formation overlooking the confluence of the Jemez River with San Antonio Creek, also a major drainage. 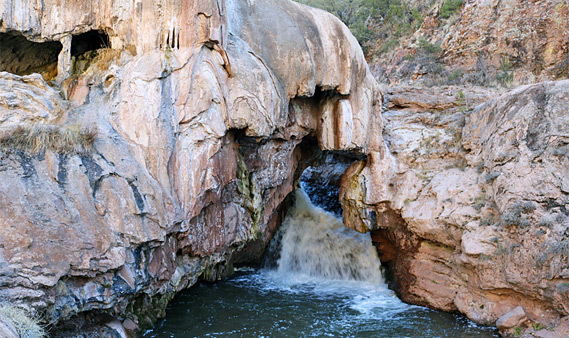 An adjacent recreation site, closed in winter, has picnic facilities, short paths and plenty of parking, plus the trailhead for a longer route, the 3.5 mile East Fork Trail, to Jemez Falls, where the river tumbles into a huge pool. The road, now following the creek rather than the river, passes two more picnic areas and the trailhead for the short hike to Spence Hot Springs, 150 feet up the east side of the valley side, this one of the most accessible in the area, soon after which the highway climbs steeply by 600 foot feet to a wooded plateau above the creek to the east, later passing the side road to the Jemez Falls Campground, start of an alternative, much shorter trail to the falls (0.3 miles). The road stays level for a while, curving gently through thick forest and past several rounded, volcanic peaks, then emerges to the great flat, grassy expanse of Valles Caldera National Preserve, centered on the collapsed interior of an ancient volcano, ringed by more rounded summits. Along the main road are several elevated viewing areas, popular places for picnics, or to look for elk. The road reaches its high point (9,080 feet) on the far side of the caldera, before starting a long, steady descent through the upper reaches of Bandelier National Monument, and finally emerges from the forest to the eastern foothills of the mountains, bordering the Rio Grande valley. Another road through the Jemez Mountains (Hwy 126) starts from the small, rather nondescript town of Cuba, at the edge of the western foothills, which are clearly visible for many miles - at least an hours driving time - across the bleak desert of northwest New Mexico. Hwy 126 is quite narrow, more steep and bendy than the main road, and is unpaved for some of its 39 miles. It climbs to a height of 8,800 feet, and passes many meadows, clear streams and inviting, open woodland, with plenty of free places to camp, along short tracks leading into the forest. There are quite a lot of scattered dwellings, but only close to the road - the land at either side has a few side tracks but most is empty and can be accessed only on foot. The mountains extend a long way to the north, including a region that contains more remnants of ancient volcanoes, the highest 11,232 feet. The one main developed site, towards the east end of the highway, is Fenton Lake State Park. A few miles further east, shortly before the road joins Hwy 4, there is a particularly good area for primitive camping, beside a lay-by right on the edge of a cliff high above Lake Fork Canyon, looking down on the Jemez River valley. It is out of sight of the main road, and little used. At night, the only artificial lights visible are from several campfires far below at an NFS campground near the river.